Do you have a dark hallway or room in need of guide lights? Install them yourself, without an electrician, with the electrical outlet guide lights from SnapPower! These fancy coverplates have little LEDs in the bottom that provide just enough light for comfortable navigation in a dark areas of the home. Best of all, each one takes just 5 minutes to install. How do they work? There are prongs attached to the plate that draw electricity from the outlet. No electrician or electrical knowledge is required – just unscrew the current plate and screw the SnapPower plate into its place. 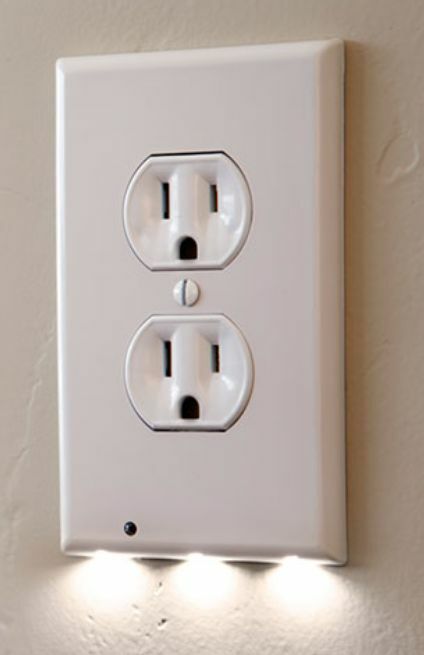 There are two styles available to fit standard electrical outlets, duplex (most common) and décor, as well as three different shades (white, light almond, and ivory). How long do they last? Each LED lasts up to 25 years before it starts to dim and costs just 10 cents per year. So, the guide lights are cost effective to run. Plus, unlike traditional nightlights, the SnapPower Guidelights leave both outlets open for use! How much do they cost? Each individual plate costs $15 US or you can buy 3 for $42 US. The more you buy, the more you save. SnapPower is also the manufacturer of a USB coverplate that works, basically, the same way. You install it like a regular coverplate and it draws electricity from the current plug. The USB outlet sits just below the other outlets, so they remain open for use, unlike other plug converters. Have you tried the Snap Power coverplates? Let us know what you think in the comments below!